This is my final Sage/Grimm post. Well… it is more of a Thank You post and a please read Grimm post!!!!! Sage has asked me to let everyone know he should be back up and running by Friday and to have a Happy Thanksgiving! When do fictional characters become real? When we fall in love with them! Last week Sage asked me to help him out by writing a few Grimm tales for his journal. He literally trusted me enough to give me the passwords to his blogs and said “just have fun!” I don’t know about you but that would take a great deal of trust and I was (beyond words) honored to have the opportunity. Besides being completely nervous and overwhelmed I accepted the challenge. Why? Because I LOVE the Grimm world. I felt like I, as a fan, won a huge contest. I wrote a Grimm everyday and feel like I could write one a day for the rest of my life. I really hope I didn’t destroy a plot point somewhere or create a tangled mess because I felt like I knew the characters and I loved interacting with them. I asked myself why are Grimm’s so easy for me to write? I think it is because Sage has created such a believable world with such believable characters. The Grimm characters are ALIVE in my mind. 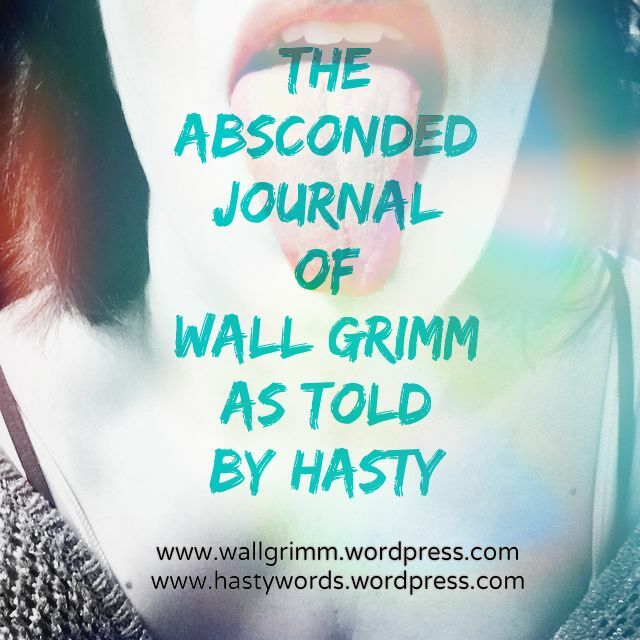 The Journal of Wall Grimm is a series of Journals written by a guy named Grimm. Grimm is a fictionalized character but like most fiction there are many situations that were based on real life events. The Grimm characters are as real to me as I am probably real to you. For all of us who blog about our real lives… How much of our real life is fiction? How much of our fiction is real? As real as I seem I am still partly fictionalized by each of your perspectives. To be clear though, THE JOURNAL OF WALL GRIMM, is fiction! I am going to give you a bunch of links below and I really do hope you take time to read them like a book. The chapters are short and before long you will feel like a character right along side them. The entries are RATED R for a reason so you’ve been warned. THANK YOU Sage for this awesome opportunity. I loved every minute of it. I hope you gain a whole bunch more readers because you have created an amazing living journal. Have a very Happy Thanksgiving! Very well said, Hasty. I particularly love this: “How much of our real life is fiction? How much of our fiction is real?” Indeed! Although I’m not the characters I write, I suppose there’s an atom [or more] of me in each of them. I will check out these stories over the holiday; they sound provocative and sardonic. Right up my reading alley, as it were. A gorgeous ‘outro’ to your wonderful contributions to the world of Grimm. You’ve made me want to read the rest, and thank you so much for the tourguide post. I’ll be sure to use it and have a look around. You know me better than most… and you are still here which means tremendous amounts to me. it becomes real when we say it does. there. My answer is when our dreams become reality and it happens so many time. All the best to you and read you soon. This is above and beyond what I expected you to do for me. Thank you. There was honestly no subliminal message that said “do you want to blog for me? (promote my blog)” lol Thank you Hasty, this is incredible and humbling, and you’re the best. I owe you for this.